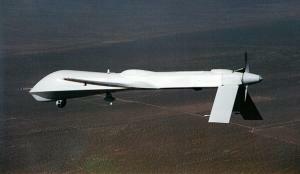 The use of cyberwarfare and predator drones (above) raise questions about the ethics of war in the 21st century. Recent leaks of classified information on drone strikes, cyberwarfare, and terror plots have prompted U.S. Attorney General Eric Holder to appoint two prosecutors to investigate these leaks. Much of the secret information has appeared in a series of New York Times articles dealing with the president’s national security decision-making. While the leaks themselves are an important story, the content of the classified information paints a picture of a president and his advisers grappling with questions of ethics in an age of unconventional warfare. Just War Theory refers to a body of thought developed over centuries by philosophers, theologians, and other scholars. It seeks to define conditions under which war is just, or ethically defensible. 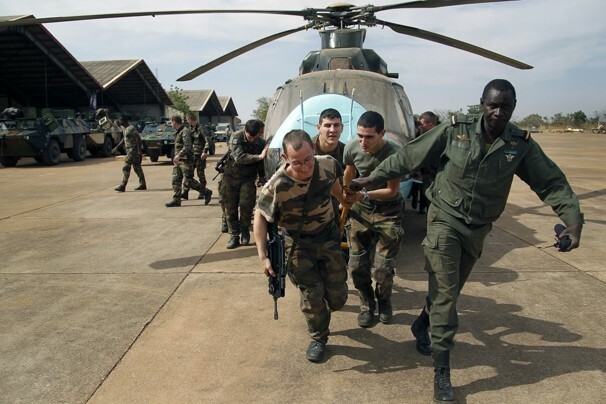 There is wide agreement on principles such as discrimination (the need to distinguish between combatants and civilians–one can target the former but should avoid attacking the latter). But applying this principle in a war zone can become very difficult. What if you are fighting against insurgents who don’t wear uniforms and use the civilian population as cover? And what if the enemy puts a tank (a legitimate military target) next to a hospital or school? Can the tank be attacked with an airstrike? What do you think? Has the U.S. been sufficiently careful to avoid civilian casualties in its use of drones and other weapons in Iraq, Aghanistan, and elsewhere? Are some civilian casualties unavoidable and thus acceptable in warfare? What are the limits of discrimination as a requirement for a just war? 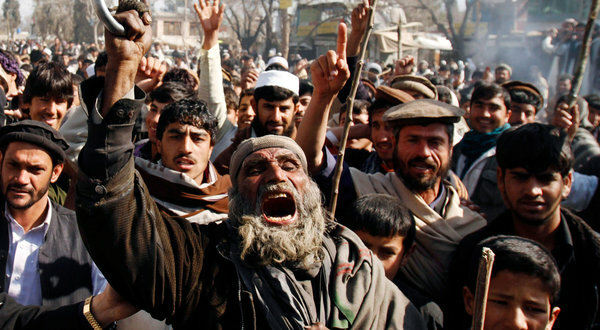 Afghans protesting against the United States after American soldiers burned Korans as part of a garbage pile at Bagram Air Field. President Obama has apologized for U.S. soldiers’ “mistakenly insulting the Koran” by burning copies of the Muslim holy book, but anger and violence against U.S. troops has escalated over the past several days. This comes on the heels of a NATO airstrike that killed eight young Afghans, for which NATO offered its condolences. These developments would be “bad public relations” for NATO and the U.S. in any war, but they take on added strategic significance in the context of counterinsurgency (COIN) warfare–the type of campaign NATO is pursuing in Afghanistan. Whereas in conventional warfare the objective is to crush the enemy quickly and decisively, COIN warfare is less about military victory and more about “winning the hearts and minds” of the civilian population. Specifically, the goal is to provide security and basic services to the civilian population so they will support the government and stop supporting the insurgents. As the U.S. discovered in Vietnam, Iraq, and Afghanistan, when the government is corrupt, autocratic, or incompetent or military force is used in a heavy-handed way–especially if civilians are killed–the population will tend to turn against the government and into the arms of the insurgents. Are the U.S. and its NATO allies on the verge of losing the war in Afghanistan? With the Obama administration’s decision to end U.S. combat operations in Afghanistan by the middle of next year, is it inevitable that the population will turn back to the Taliban out of fear or necessity? What, if anything, can be done to turn the tide in favor of the Karzai government and its external supporters? The Obama administration is reportedly considering dramatic cuts in America’s nuclear arsenal. Read the below blog post and then vote on whether or not this is a good idea. 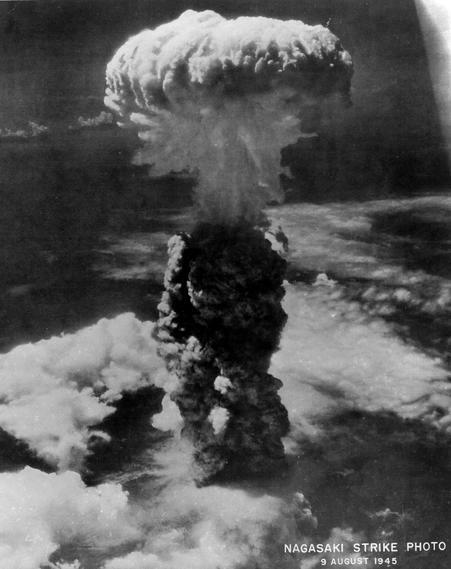 The atomic explosion over Nagasaki, August 9, 1945. Some analysts believe that a 300-weapon nuclear force would be sufficient for deterring adversaries and would help to convince countries such as Iran and North Korea to forgo nuclear weapons development. But critics, including Republican members of Congress, have denounced such ideas as “reckless lunacy” that would undermine American security and do nothing to dissuade rogue states from acquiring nuclear weapons. Indeed, during the Cold War the impetus for building thousands of nuclear weapons and dispersing them across multiple types of delivery vehicles and geographical locales was that if all of a country’s nuclear weapons could be destroyed in a first strike, retaliation could not be assured and there would be nothing to deter the enemy from striking first. (The doctrine of Mutual Assured Destruction, or MAD, was built from these premises). What do you think? Are dramatic cuts in America’s nuclear arsenal a good idea or a dangerous one? Take the poll and let us know your views.